The Ordnungspolizei (German: [ˈʔɔɐ̯dnʊ��spoliˌt͡saɪ], Order Police), abbreviated Orpo, were the uniformed police force in Nazi Germany between 1936 and 1945. The Orpo organization was absorbed into the Nazi monopoly on power after regional police jurisdiction was removed in favor of the central Nazi government (Verreichlichung of the police). The Orpo was under the administration of the Interior Ministry, but led by members of the Schutzstaffel (SS) until the end of World War II. 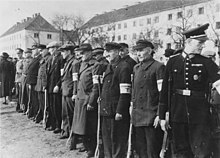 Owing to their green uniforms, Orpo were also referred to as Grüne Polizei (green police). The force was first established as a centralized organisation uniting the municipal, city, and rural uniformed police that had been organised on a state-by-state basis. Wikimedia Commons has media related to Ordnungspolizei (Nazi Germany).